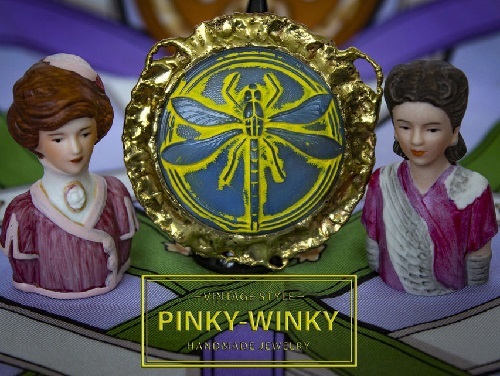 Pinky-Winky – vintage inspired group of young artists, designers and jewelers engaged in creating unique jewelry, sculptures, toys in papier-mache, dolls, painting and home decor. 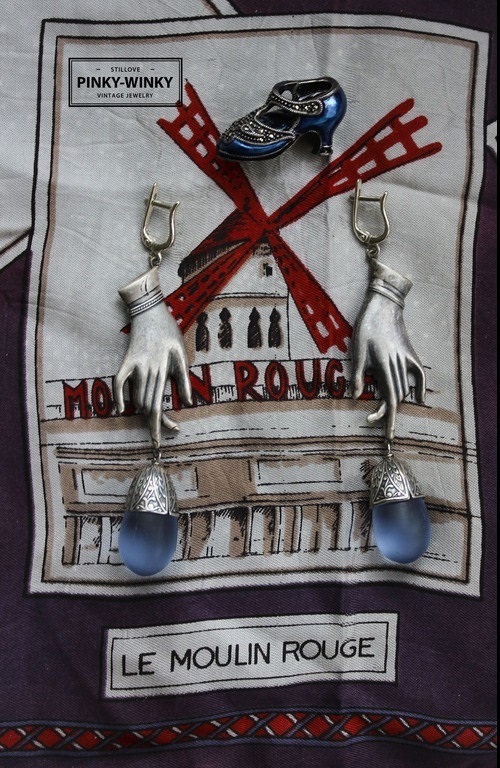 Masters often create items in vintage style, often complementing the already well-known brands of 1940-1970, for example, to an existing brooch they create earrings or a necklace made exactly in the given style. The creative Moscow based team regularly takes part in various art exhibitions and fairs. 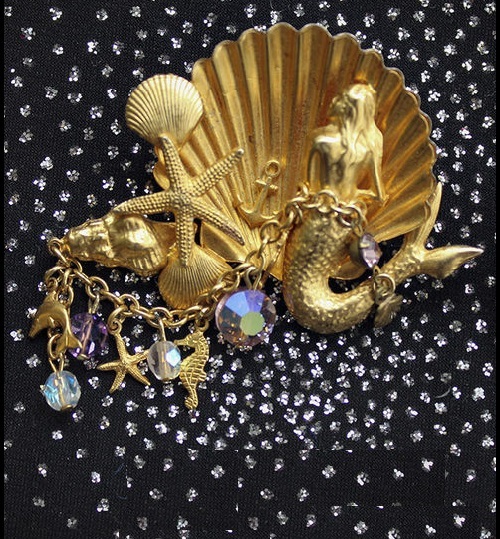 Pinky-Winky vintage handmade jewellery can not leave anyone indifferent for their artistic approach and fantasy. 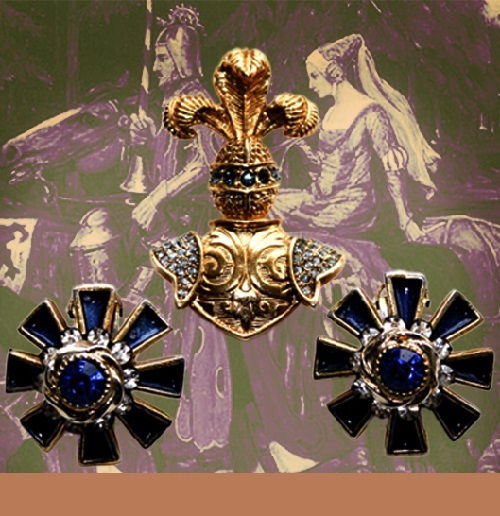 Set of jewelry ‘Royal Guard’. 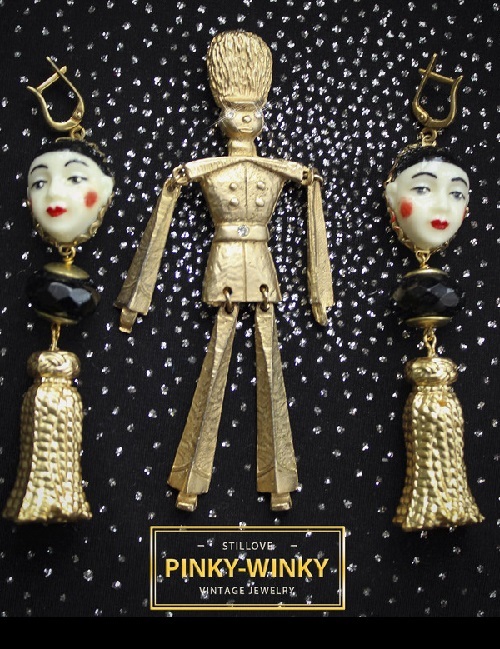 Brooch – vintage 70s Costume jewelry, alloy of gold color, hands and feet moving, Earrings Piero – the author’s work from the Pinky Winky, silver with gold, resin, bead, Czech glass. Magic Flower Brooch Vintage jewellery 1950s style, golden color metal, rhinestone. 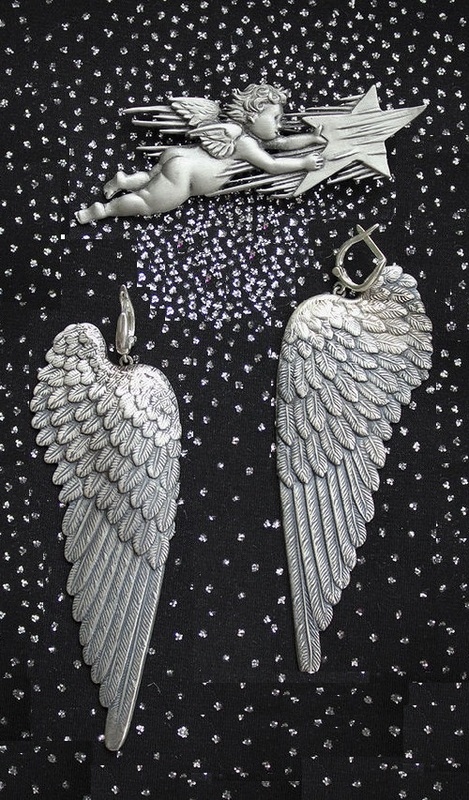 Earrings Angels of silver and gold, brass, baroque pearls. Pearls of irregular shape – a teardrop-shaped, ellipsoidal, pear-shaped in the form of buttons, oval or tablet, called the Baroque. The name comes from the word baroque – so were called pearl stones, which shape is significantly different from the classical spherical. 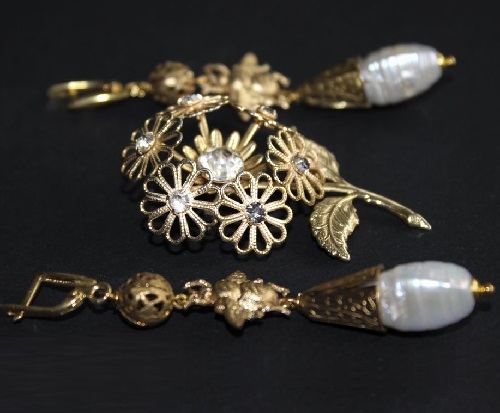 Baroque pearl grows in mollusk shells, which are traditionally stud in the southern seas. Caressed by the sun and warm waters, pearls absorb the energy of the world, which gives them a smooth shape and incredibly beautiful shine. 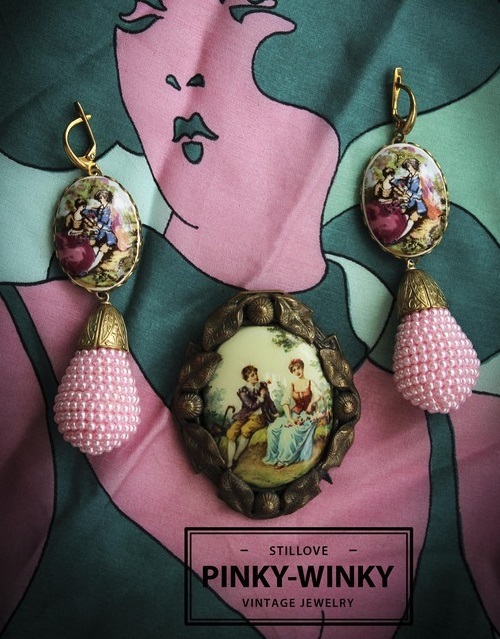 Copyright earrings in vintage style. The central element of decoration – bee. Bees involved in a huge number of cosmological myths and legends as an ally of God against the evil spirit. Usually bee stings the enemy, but sometimes it suffers from a loss. An indirect reference can be considered a widespread legend of a link between bees and the Mother of God. In some traditions bees directly connected with fertility. However, the bee performs the royal way power (eg, in Egypt), a special vital force – the manna, the royal wisdom, the accumulated like bees collect nectar. The ideal structure of society in its monarchical form is usually related to a beehive, the anthill as a contrasting image of a democratically-leveling hostel. 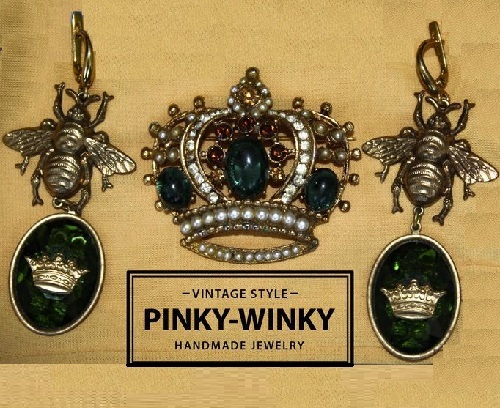 Copyright ring from Pinky Winky. Copper, brass, cabochon of Bohemian glass with crystals. 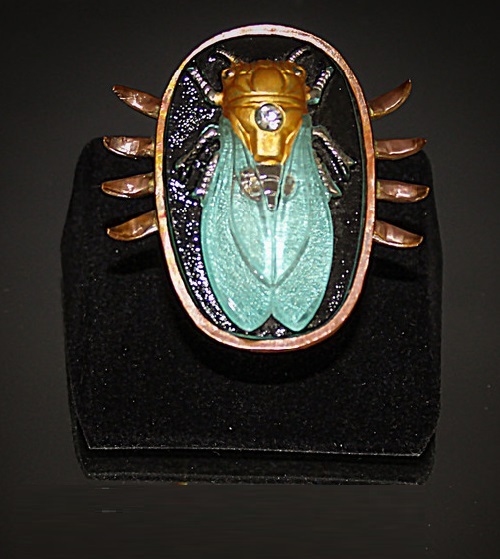 Cicada embodies the magical protection from negativity and is a symbol of eternal life and longevity.